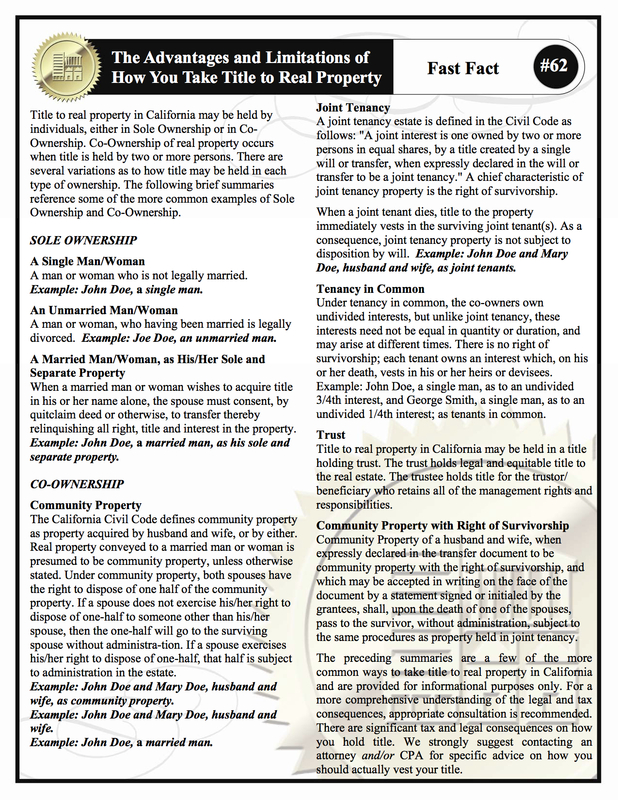 What are the most common methods of holding title to property in California? There are plenty of big decisions that need to be made during the process of buying a home or condo. One decision that buyers often don’t consider in advance is how they’d like to hold title to the property. The method of holding title, often referred to as “vesting”, can have significant legal and tax implications so it should always be discussed with an attorney or tax pro. Before the sale can be completed, the title insurance company will need to know how the property is to be vested. Thinking about the options in advance may help to make the process smoother for you. The chart below from Fidelity National Title summarizes the more common methods of holding title. Click on the chart to enlarge it. If you are considering buying a home in SF (or anywhere else for that matter) just let me know, I’ll be happy to help. Posted in Buyer Tips, Education, Escrow & Title.